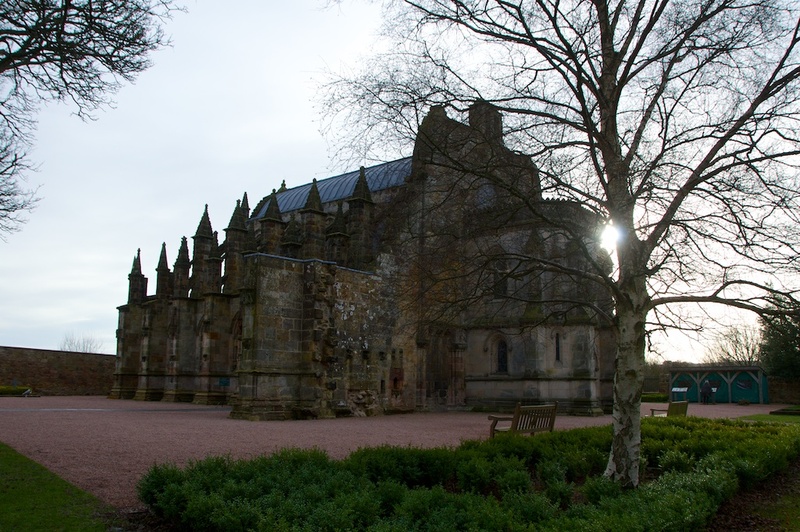 Mention Rosslyn Chapel in a sentence, and at some deeper level you’re immediately aware of a whole can of metaphysical worms being opened. You can almost see them writhing around. Many of the places I write about on The Hazel Tree I’ve visited with hardly any preconceptions; quite often, I stumble across a place by accident and discover the history afterwards. 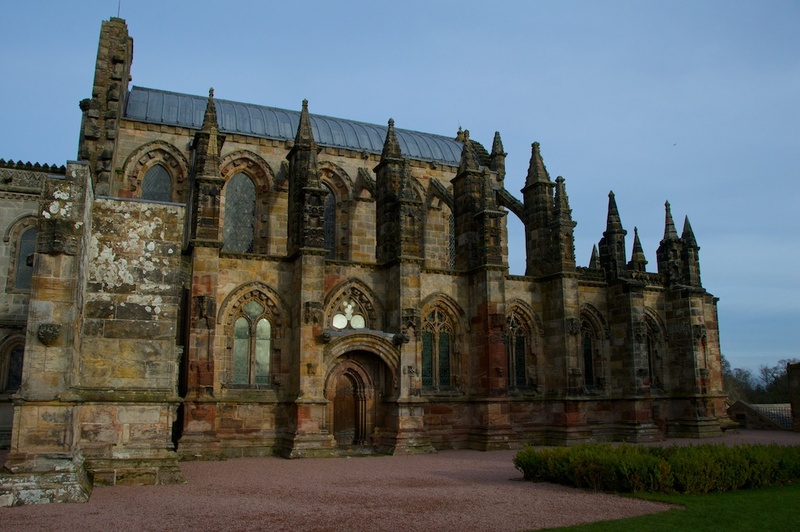 Like millions of people, I read Dan Brown’s ‘The Da Vinci Code’ about 10 years ago, and so the image of Rosslyn Chapel was imprinted on my mind. The whole story about the rose line and the ancient secrets embedded in stone was so alluring, and even though much of it was fiction, I couldn’t help wondering just how much truth there was underneath. And ever since we moved to Scotland, I’ve been noticing Rosslyn on the map, and thinking, “I really must go there one day.” But unfortunately, this was always followed, in my imagination, by a vision of thousands of tourists jam-packed into a tight dark space, and I would put it off again. Plus, I had a vague and probably misplaced apprehension about the Knights Templar: exclusively male, obsessively secretive, well-meaning but a little bit jinxed. 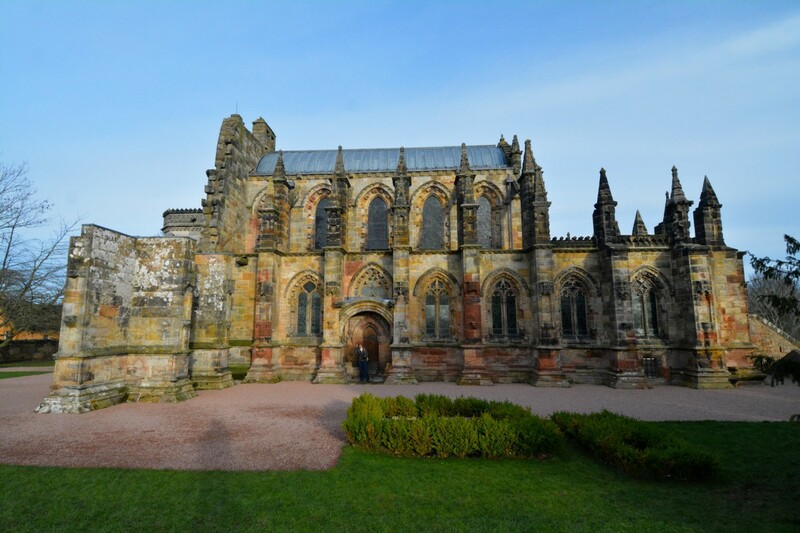 We finally made it out to Rosslyn Chapel on a bright morning in January. It was sunny but cold, with a brisk wind whipping off the Pentlands. People were rolling up in ones and twos, not hundreds, which I found encouraging. 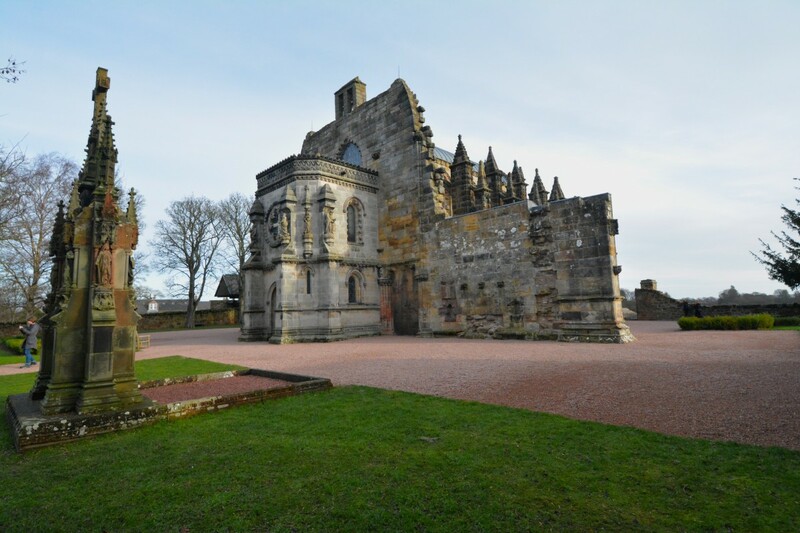 Rosslyn Chapel was the vision of an ambitious and far-sighted nobleman called William St Clair. William was the third and last St Clair Prince of Orkney, and in 1436, at the age of 22, he accompanied James I’s 12-year-old daughter, Margaret, to Tours, where she was married to the Louis, the son of Charles VII of France. While he was there, William decided to make the most of it, and he spent four years exploring the Continent. He made a particular study of the French cathedrals and their beautiful Gothic architecture. 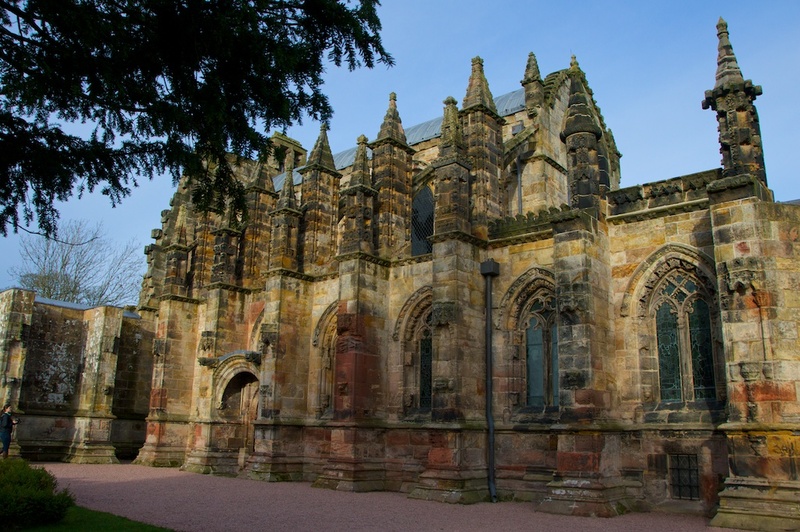 Ten years later, in the low wooded hills of Midlothian, he founded the Collegiate Chapel of St Matthew, or Rosslyn Chapel as it is better known. By my reckoning, William would only have been 32 when he founded the chapel, so I’m not sure how he would have felt about the idea that age was creeping up on him. However, he must have been one for looking ahead, and he was certainly a man who dreamed big. The honeycomb design is an interesting element, which I’ll explain later on. It’s difficult to overstate the magnificence of William’s vision. He wanted his church to have a tower that was visible from Edinburgh, and his original cruciform plan extended at least 34 metres (111 feet) further on from the existing west end. He was, in fact, building a cathedral to rival those of northern France, but on a smaller scale; and he may have been particularly influenced by Rouen, where his ancestor, Rollo, 1st Duke of Normandy, had been laid to rest. It’s also interesting to discover that the number and layout of Rosslyn’s pillars are an exact mirror of those in the choir of Glasgow Cathedral, built some 200 years earlier. For the next 40 years Rosslyn must have been a hive of activity, and William spared no expense. 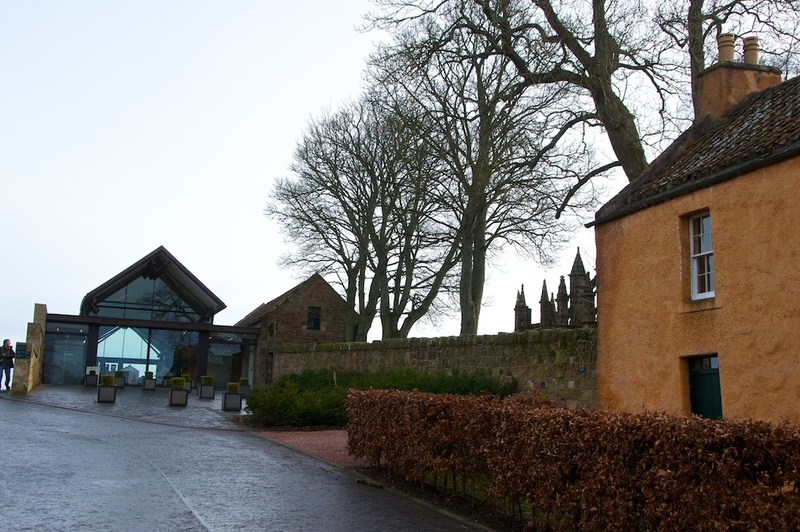 According to Father Hay, he brought master craftsmen “from other regions and foreign kingdoms and caused daily to be abundance of all kinds of workmen present as masons, carpenters, smiths, barrowmen and quarriers…” To house them all, he created the village of Roslin. 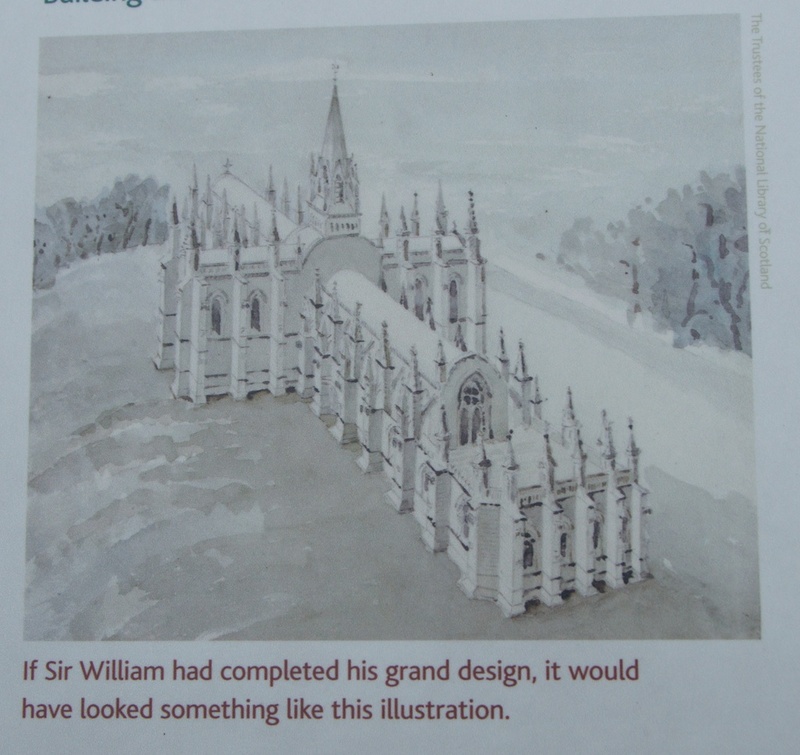 But William’s dream outlived the man, because he died in 1484 with his chapel still unfinished. His successor, Oliver St Clair, added the stone-vaulted roof but made no efforts to extend the building. The tower was never built, nor the nave or the transepts. What we see today is just the choir of William’s grand plan, with a small baptistry which was added to the west end in 1880. Despite its moderate size, Rosslyn Chapel is one of the most lavishly decorated buildings I’ve ever seen – and that’s just on the outside. 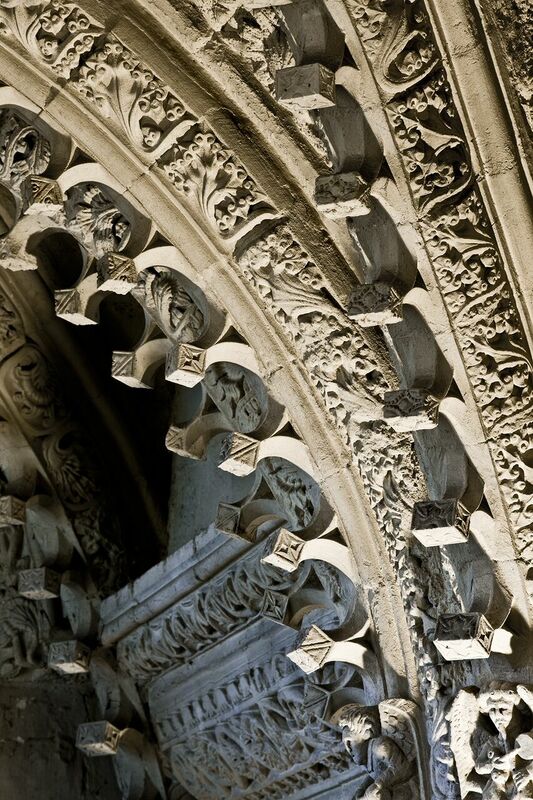 Faces, flowers, leaves and symbols of all kinds adorn windows and doorways and garnish the pinnacles of the flying buttresses. Randomly dotted around the stone blocks of the walls are small masons‘ marks, while secreted under a low jutting pillar at the east end we found a star-shaped carving, which I’m told is the ‘foundation stone’. My horrors about a dark, claustrophobic space evaporated as I stepped through the door. The interior was filled with light. Everything looked white, although in reality the stonework is somewhere between grey and cream. The only colour came from the magnificent windows. Your first glance, upwards at the barrel-vaulted roof, strikes you speechless with awe. The ceiling is divided into five sections, and each section is filled with row upon row of carved flowers and stars. As you study them further, you realise that each section has flowers of a slightly different design: looking from east to west, they progress from four-petalled flowers, through flowers with leaves, to double roses, lilies, and stars. I pondered this for a while and wondered if they were a symbol of the stages of life, from birth through to death and possibly an afterlife. Interestingly, the stars in the last section are all geometrically spaced, apart from two, which appear to be colliding. Hidden among them is a sun, a moon, a dove, and the face of Christ with his hand raised in blessing. And this is just the beginning. Welcome to the mysterious realm of Rosslyn. The five roof sections are separated by lines of stone ‘ribs’, each studded at regular intervals with small three-dimensional sculptures which jut downwards into the hollow space. In the centre of the roof, on the second rib from the east, is a carved projection known as the ‘keystone’. This bears the St Clair (or Sinclair) shield and cross, held between two hands. You’d think it would be obvious, but in fact there is so much embellishment on the ceiling that it’s easy to miss. You could come here week after week, year after year, and still find something you’d never seen. One question that rose in my mind was how on earth Rosslyn managed to survive the Reformation. The answer is that many of its sculptures didn’t, particularly those depicting Christ and the saints. All around the walls are empty niches that would once have supported statues. In 1650, the troops of Cromwell under General Monk attacked Rosslyn Castle and stabled their horses in the chapel; and in 1688, a Protestant crowd entered and damaged some of the furniture and vestments. It was abandoned until 1736, when the windows were re-glazed and the roof repaired. It is amazing to consider just how much of it has survived. When William and Dorothy Wordsworth visited Rosslyn in 1803, Dorothy wrote in her journal that “the architecture within is exquisitely beautiful”. When I read about the recent restoration work done here, I was staggered by the sheer quantity of carving that there was to clean. 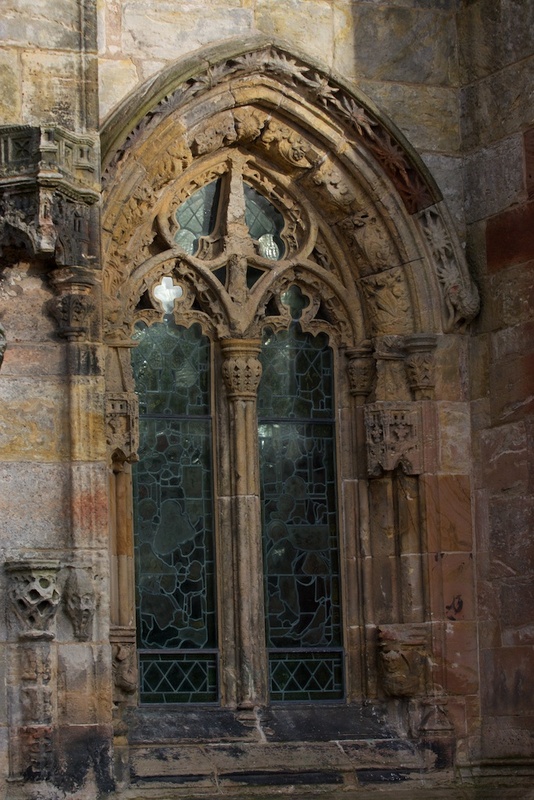 In the 1950s, the interior of Rosslyn Chapel was suffering from the effects of damp, and many surfaces were covered with green algae. The thinking at the time was very proactive, if rather misguided, and as a result of an Ancient Monuments inspection all the internal carvings were scrubbed down with a stiff bristle brush before coating with a solution of magnesium fluoride. 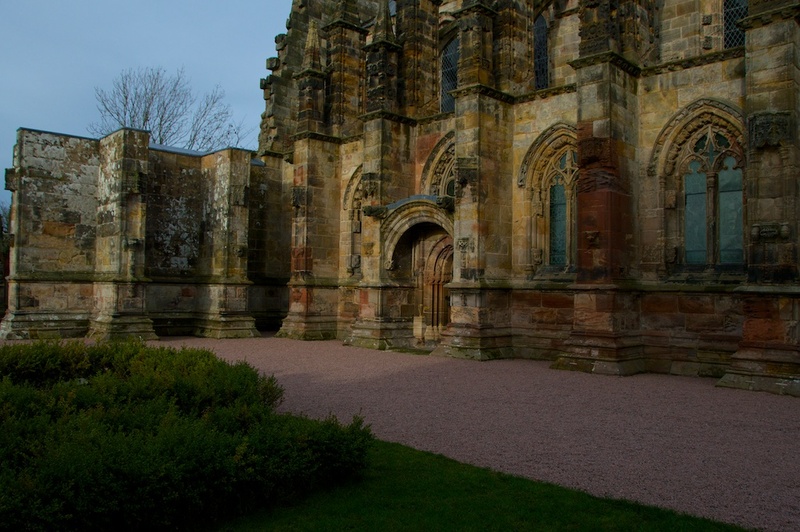 This caused problems of its own, not least because the coating effectively sealed water into the stone, rather than allowing it to breathe; and in 1997 a free-standing steel roof was put up over the Chapel to allow the stonework to dry outwards. This protective roof was in place for 13 years, and was removed in the summer of 2010. 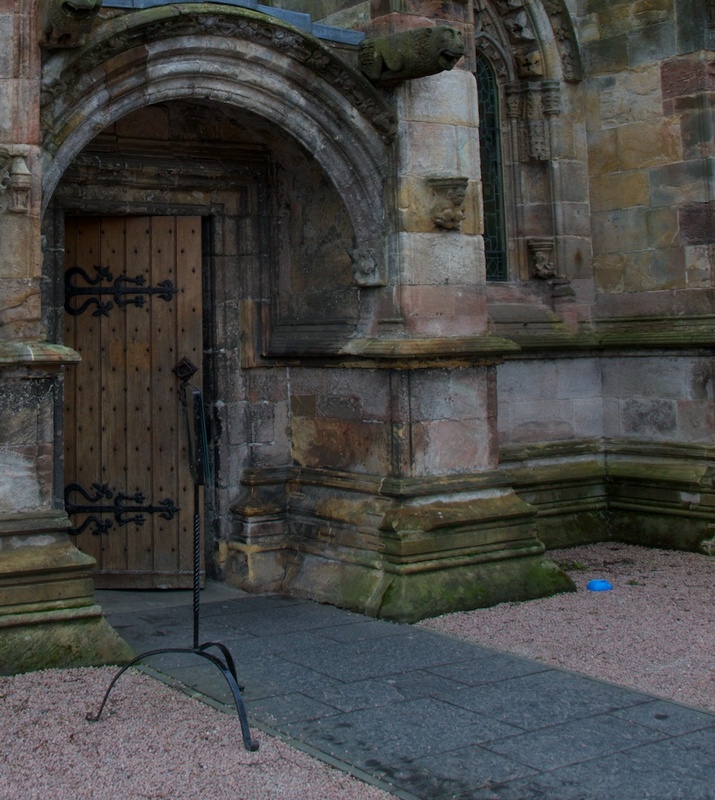 The Lady Chapel (left) and the Apprentice Pillar (right) courtesy of Rosslyn Chapel. 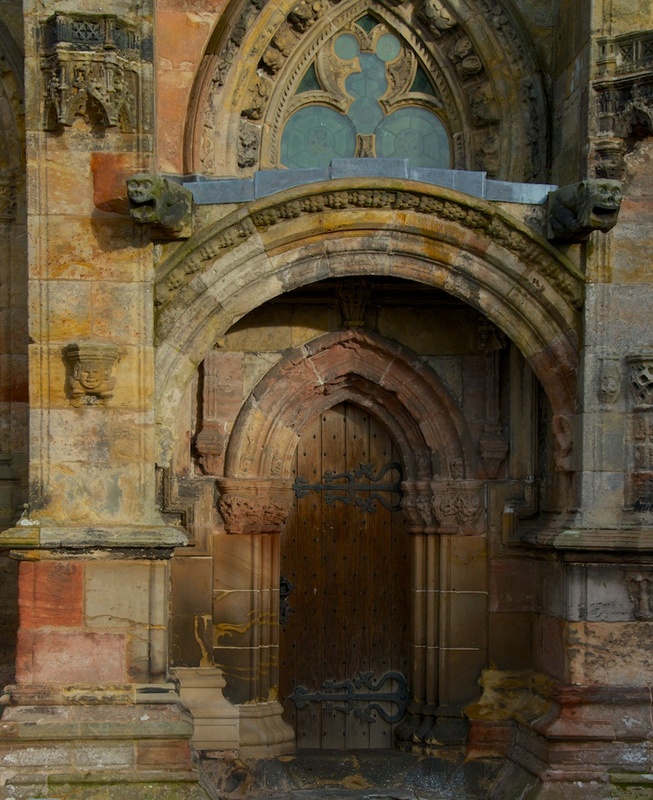 It seems that with every step you take inside Rosslyn Chapel, there is a new feature of mystery and intrigue. I am not going to catalogue them all. The joy is in discovering them for yourself. But it’s impossible not to mention Rosslyn’s best-known features: two pillars, known as the Mason’s Pillar and the Apprentice Pillar, which flank the Lady Chapel at the east end. Both have exquisite carving, but the Mason’s Pillar is decorated in straight vertical lines, while the Apprentice’s Pillar has beautifully garlands of foliage flowing in spirals up from the base. And there is a story about this: the mason, having been asked to produce a pillar of magnificent craftsmanship, took himself off to the Continent to brush up on his skills, leaving his apprentice in charge at Rosslyn. But the apprentice thought he’d have a go himself, and produced a pillar of such exquisite quality that his master, on his return, flew into a jealous rage and killed the apprentice on the spot. 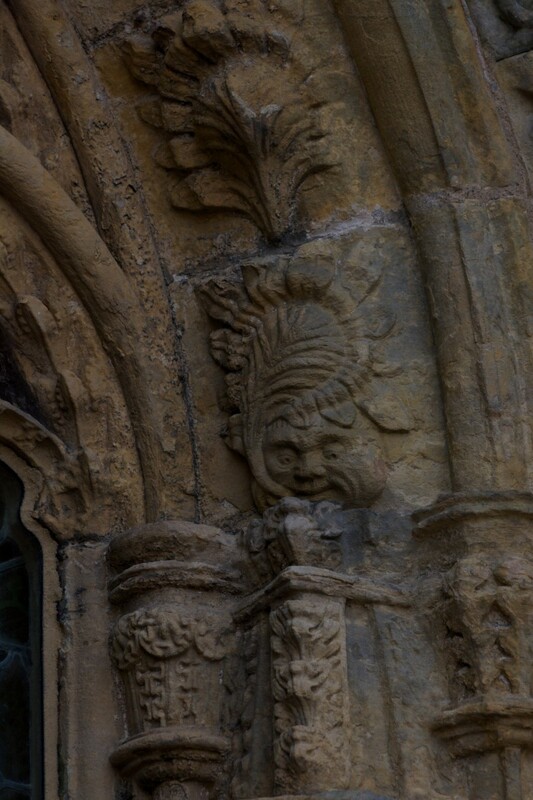 Small carved grotesques of the mason, the apprentice and his grieving mother are dotted around the church. I was more interested to read that the spiralling foliage is thought to be rising from the dragons of Yggdrasil: this was a giant ash tree in Norse mythology, standing at the centre of the universe. People have compared the flowing spirals with the structure of DNA. 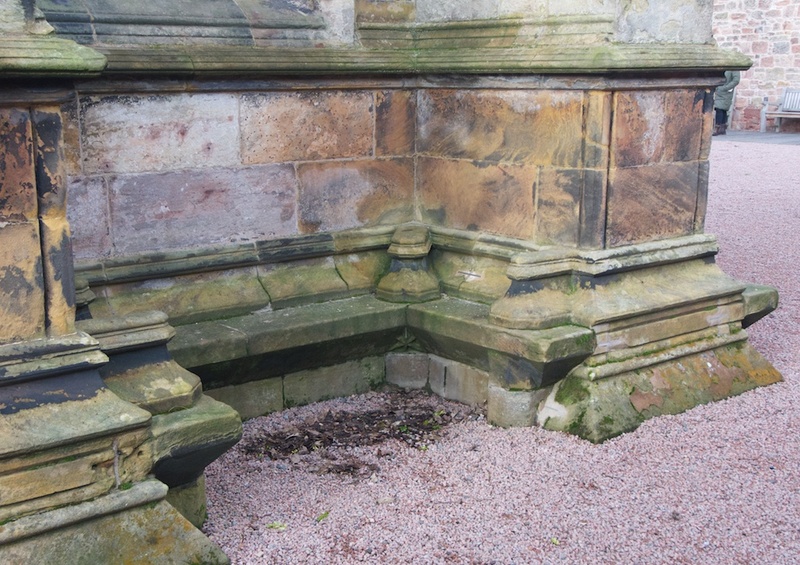 On the south side of the Lady Chapel, a flight of stone steps lead down to the sacristy or crypt, which is thought to pre-date the 15th century chapel. In this dim hollow space you can just make out geometrical shapes faintly scratched on the walls, thought to be the working sketches of masons as they developed their designs. 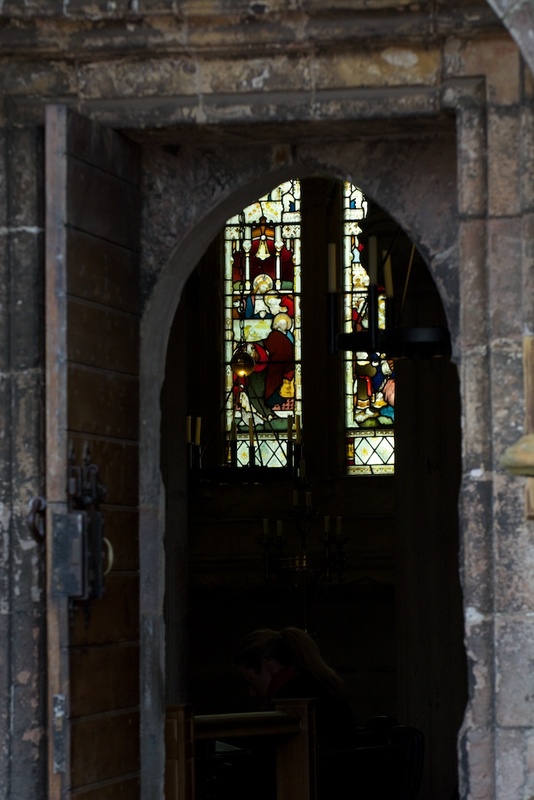 A beautiful stained glass window – partly covered with scaffolding when I was there – allows light in from the east, while a small and rather claustrophobic antechamber to the left houses a collection of loose stone carvings. There was another opening on the opposite side, which looked as if it led to further chambers, but the access was blocked off. Rosslyn’s crypts are the focus of most of the legends and folklore about the place. The original vault – the location of which is still unknown – is where, according to various tales, a host of Templar knights lie entombed in their armour; a piece of the cross of Christ’s crucifixion is hidden; and the original crown jewels of Scotland are buried. This is by no means all. In addition, a tunnel is said to lead from the crypts of Rosslyn right down to Rosslyn Castle, which lies several hundred yards below it in the glen. Mystery, metaphysics, or madness? It all depends on your point of view. But it seems to me as if the landscape of Rosslyn is capable of amplifying people’s reactions to it, so that whatever you find or sense as an individual can be felt very strongly. Plus, I do believe that if you look for something hard enough, you will find it. My own impression of Rosslyn was one of light: it felt like a place of blessing and healing. I was quite surprised by this, as I had been expecting something quite different. I’d taken my dowsing rods to Rosslyn, with the rather optimistic intention of trying them out. This, in the presence of quite a few tourists, is easier said than done, as I’m still a beginner and not wanting to attract undue attention. 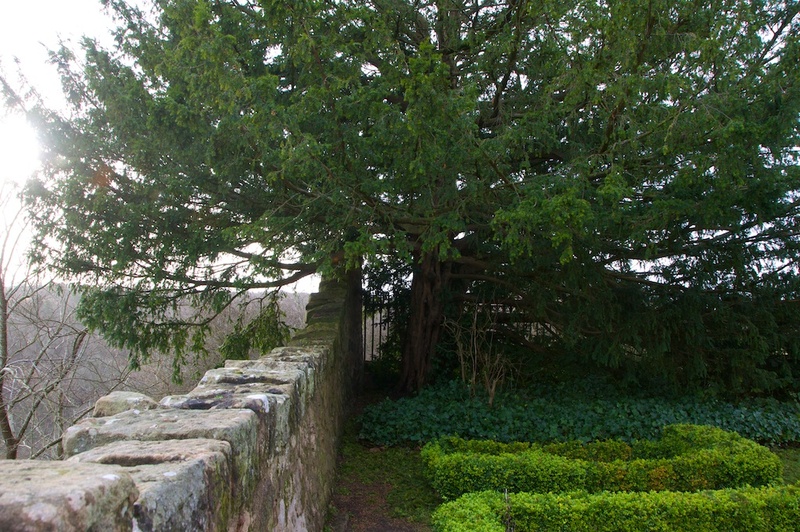 But at the east end, my rods turned and then started spinning the closer I got to the wall; and round at the west end, I noticed two fairly old trees – possibly cherries – one of which was particularly twisted and gnarled, and leaning over the path that leads to the west door. I did a bit of dowsing around this, without any ground-breaking results. Inside the chapel, although I kept my rods stashed away, I had a sensation of light pouring in from the west, and coming up in a brilliant shaft towards the altar; not a revolutionary idea, I have to say, but one that was nicely echoed in visual terms when I went back outside and photographed the low afternoon sun flashing over the wall of the baptistry. Rosslyn has over 100 ‘green men’. They are harder to spot than you might imagine! Dowsing friends tell me that the sacristy or crypt is where the energy is the strongest, and one of them described the atmosphere in there as being particularly ‘thick’ after a few minutes of chanting. Sound is an important element that we tend to overlook, but all churches and even (in some opinions) much older burial chambers were shaped to allow sound to swell and resonate, perhaps with healing purposes; and my instinct is to wonder if they hold that energy, like a residual memory, allowing us to detect and interact with it. One of the many stories about Rosslyn is that it was once a shrine for the skull of St Matthew. An ancient story tells of Matthew travelling to Myrna in Turkey and planting his staff in the ground. Immediately the staff took root as a tree, and sprouted with fruits and vines. A beehive in the branches sent a cascade of honey down to the base. 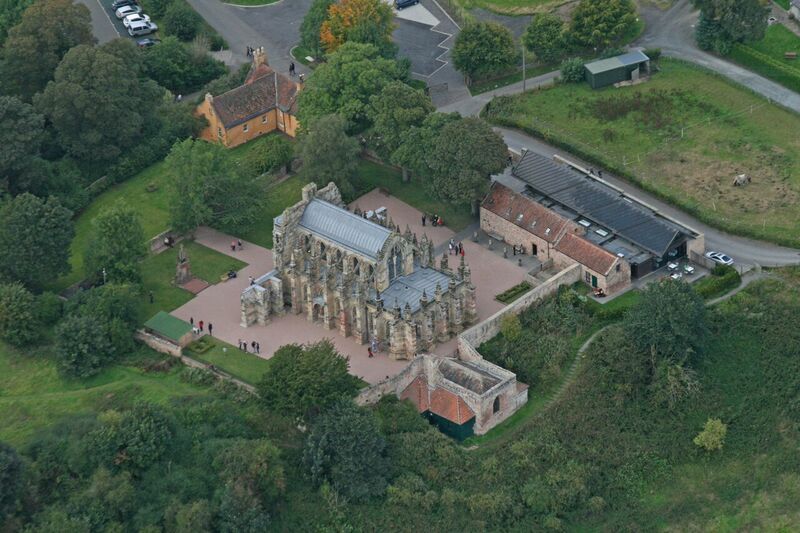 At Rosslyn, one of the pinnacles on the north-east corner was hollowed out to allow wild bees to make a nest there. For centuries, it was known to local people that honey dripped down the wall of the building – and, according to some stories, it was collected inside the church, on the altar of St Matthew. (Interesting to remember that the earlier shrine in Rosslyn Castle had a honeycomb design). And if this all sounds a bit far-fetched, think again: it seems that bees respond to earth energies, and they have been discovered to nest in churches and farms along ley lines in Dorset, as bee-keeper Chris Slade observed in his blog only recently. In the midst of all the symbolism and intrigue, there was one feature outside the chapel’s north door that I recognised immediately: a blue plastic cat’s bowl. So Rosslyn has a cat… and his name, fittingly enough, is William. I would have been delighted to meet William, but he was obviously making social calls elsewhere and was not available for comment. I have a feeling that Purdey should make his acquaintance. I wonder if he might be persuaded to enter the PAWS Awards next year? Imagine the potential! The property is owned by the Earl and Countess of Rosslyn. You can find full details about admission prices, opening times and facilities on the Chapel’s website. The modern Visitor Centre has a coffee shop and state-of-the-art interactive displays. I’d recommend the guide book, written by the Earl of Rosslyn, which is very informative. We were lucky on our visit, as it was out of season and the crowds were minimal: if you have the chance to visit during autumn or winter, I’d advise you to do so. No photography is allowed inside the chapel, and I am grateful to the Learning Officer at Rosslyn for supplying me with the internal photos. 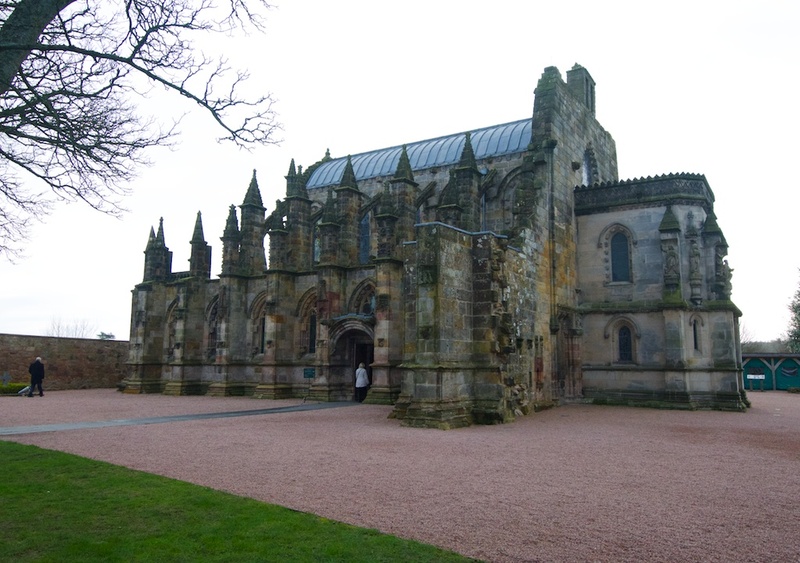 Rosslyn Chapel is part of the Scottish Episcopal Church in the Diocese of Edinburgh. Services are held here every Sunday, with short prayer services on Mondays, Wednesdays and Fridays. The Countess of Rosslyn has made a very good documentary about the history of Rosslyn, which at the time of writing can be viewed on YouTube (part 1 here). I do not know if it is available worldwide, however. It’s easy to overlook, but just a short walk down the wooded hillside brings you to the quiet and enigmatic ruins of Rosslyn Castle. Thanks for the Tour….so good I will not need to visit now! Just joking it has wetted my appetite a little more and we will excuse Dan brown for increasing its popularity, after all the tourist should help fund conservation work. Welcome, David, glad you enjoyed it! Thank you for the pictures and commentary Jo. It is still somewhere I have to see one of these days. Thank you very much, Scott! Yes, the scaffolding was up for a long time. I think the Da Vinci scenes were filmed in one of the small antechambers in the crypt. I was taken here on a surprise visit in autumn 2014; it is an awe-inspiring building and we are lucky to be able to see it today. That’s very kind, and thank you for your comment. Yes, there must have been a real advantage in the shelter/roof, if you could get that close to the stonework! What a lovely story about the Mayor and the hidden treasure – I think he echoes what a lot of people would say! Thank you so much for sharing your memory of the place. What a fantastic place and what a fantastic post! Thanks for sharing! I like the colours of the bricks: red shades, orange shades, yellow ochre and other grays. Yes, we loved them too, and they are often all swirling together in the same stone – very beautiful. That’s amazing! What a lovely story. Thank you, Bonnie, for sharing it! We underestimate the power of prayer and human kindness. Glad to see you returned unscathed. It’s not the prettiest of churches, very dark and brooding, but a fascinating past nonetheless. You’ll be off to the Vatican next, then? Haha, thanks, Alen! No, I wouldn’t call it pretty, exactly. There’s something about it that brings out very strong feelings in people, as I’m finding out in other places where this post is being shared. The Vatican? 😀 Don’t hold your breath! Have you ever been? No, I haven’t been. But I’m reading Umberto Eco’s The Name of the Rose at the moment, and I quite fancy visiting his abbey, although he doesn’t name it. I think I might add that to my list! Sounds good. I saw the film version first, many years ago. Absolutely stunning. Sean Connery as Father William, a 14th Century Franciscan friar in a mountain-top monastery in Italy. Such beautiful pictures. When I was there they were doing a bit of restoration. It was still the most beautiful thing I have ever seen! Thank you, Cathy! 🙂 Yes, isn’t it amazing?! Restoration is an ongoing, never-ending thing, I would imagine.